Practicing one creative discipline is more than sufficient. 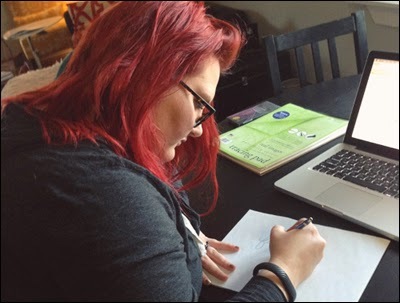 Krista Engler takes on three roles: Designer, Front-End Web Developer, and Illustrator. Her versatility is impressive. Here, she expresses her proactive drive to learn without hesitation, and shares aspects about how she works, being three distinct creative practitioners in one. How did you arrive at being a designer? Was there an initial encounter of design-related work that played a role in your professional path? I had always been a creative kid. I loved doodling. In high school, I was actually the last of my friends to have access to a home computer. I was completely enamored with it and quickly found myself a pirated copy of PaintShop Pro. I used it to create fake album art and design a theme for my personal blog. My blog designs were well-received, and I even designed a few for other people. I don’t even really know where I first heard the term “graphic designer”, and honestly, when I picked it as my degree, all I really knew was that I’d be making art on a computer. What were essential activities/steps you took to start and establish yourself as a designer? And why were these activities/steps important? I feel lucky that I picked (somewhat randomly) a career that I was able to stick with and really genuinely love. I went to college at Appalachian State University in Boone, North Carolina, and earned a Bachelor of Fine Arts in Graphic Design. I don’t know that having a degree is really essential anymore to be a designer or developer. There are so many resources online (SkillShare, for example) where you can learn without the burden of student loan debt. Also, school can only teach you so much. Internships and hands-on training are super important and give you a more realistic sense of what being a designer is really like. Outside of my education, I’m constantly learning. I think that’s what’s most appealing to me about design—we’re constantly forced to learn. I’ve been working in the web-side of graphic design for over five years now, and every year, technology, techniques, and trends change tremendously. You have to be willing to learn. It is vital. Drawing is a big part of my process. How did you also become a web developer? What were specific things you did to initiate this role and familiarize yourself with its concepts and their application? My college education was primarily print-based, but my first job out of school was a web-design position. I had taken a few courses that taught the basics of HTML and CSS, but most of my development experience was learned on the job. I learned a ton about web development in my first three years as a designer, and I feel that having that development experience has made me a better designer. I know the limitations of the medium, I can better design things that make sense in the browser, on your phone, etc., and I can speak to developers using their language and even make suggestions for functionality. How did you also gain the skills of illustration? Was this part of your graphic-design schooling? Or did you always like to draw? I’ve always been a doodler, even back when I was a kid. My husband is also a designer, and he’s an incredibly talented illustrator, his drawing skills are very inspirational. I’ve always been envious of designers who are good illustrators, because they are able to create more visually engaging assets for their designs and generally seem to be better designers. Illustration has always been my weak point, so last year, I made a resolution to draw more, and I really think it has helped. I started off making custom icons sets for my web designs, just to get in some simple practice, then I moved on to doing more hand-lettering, and now, I do full-fledged illustrations pretty regularly. I think over the past year, I’ve really developed my own style, and it’s so rewarding to get a RFP (Request for Proposal) from a potential client who picked me, not just because I’m a designer, but because I’m a designer whose style they like. and practicing design, web development, and illustration? I work. A lot, haha. I have a full-time gig as an Art Director at a small boutique design agency called Cobble Hill, and I also freelance. I rarely have a free weekend, but I love it. I work on a lot of self-initiated projects, which I think is pretty important to do. Especially when you’re just starting out, fresh out of school—you should do as much work as you can. As with anything, practice makes perfect. I also read a lot of design blogs (Swissmiss, Design*Sponge, Smashing Mag, The Best Designs, etc. ), go to artists’ talks and exhibitions, take classes, hang out with other designers, etc. Who and/or what are your creative influences? I’ve recently noticed that I’m drawn to designers who are also really great illustrators such as: Joey Ellis, Matt Stevens, Ryan Brinkerhoff, Greg Christman, Gil Shuler, and Jay Fletcher. Milton Glaser has always been a big inspiration to me too. I’ve had this video bookmarked since I graduated college—anytime I feel like giving up, I watch it, and it makes me feel good again. 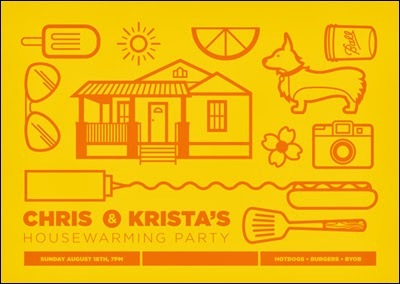 Invitation that I had printed as a sticker sheet for my housewarming party. I think instincts can play a role in design, but it’s much easier to sell a concept if you design with purpose. What is your process of doing creative work? I start by gathering as much info as I can about the project and the client. I often ask clients to create a Pinterest board of things they like, not just designs but anything that appeals to them—objects, designs, photographs. This helps me get a feel for their personal style. I’ve learned over time that it can sometimes be hard for clients to verbally describe what they like, and this is something I started doing that has really worked well for me. From there, I will start on paper, quickly drawing ideas, writing ideas, just coming up with ideas in whatever format they come to me in. I’m a terrible sketcher! 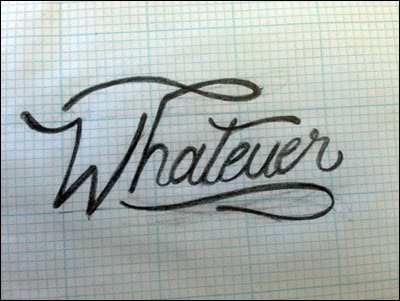 I get so frustrated when I see beautiful sketches on Dribbble because my sketches will never look like that. From there, I pick a few ideas that I like and bring them onto the computer to flesh out. If I’m feeling stuck I like to go on a walk, it’s a nice way to clear your head and sometimes something you see on your walk will be just the dash of inspiration you need! I recently started using grid paper, from Staples, for hand lettering which has truly changed my life, give it a try! Besides the above listed, I work on a MacBook Pro with a Logitech Wireless Performance Mouse MX. Stemming from a recent discussion I had with new designers, does having a point of view play a role in designing? If so, how? If not, why? When I’m designing, I tend to consider many different points of view: that of the user, of a strategist, and of a designer. Web design, in particular, is a balancing act of trying to make something innovative, but also making something that is still intuitive to use, and of course, it should look good too! Outside of work, I think being a designer gives you a particularly unique point of view, because you end up seeing the world as it pertains to design. Design is definitely a male-dominated industry—in web development, the gender gap is even larger, but there are lots of lady designer/developer role models out there! 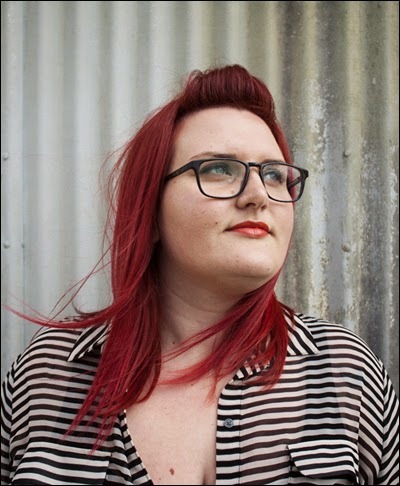 A friend of mine, Melanie Richards, runs a website where she showcases women in creative fields called Badass Lady Creatives. I think it’s a good indication that women are in these creative fields making really good work. I read recently that being passionate is often perceived as being difficult, and it really resonated with me. I work in a really small team, and I’m lucky that we’re all usually in agreement with each other. Sometimes there can be tension when either a client or co-worker who suggests a change that is arbitrary or based on personal style. I generally don’t have a problem with design changes or suggestions as long as they serve a purpose. If you can explain why you think I should make that change, then I’m on board! Disagreements certainly happen, but I think it’s important to respect your peers and their suggestions, regardless of your opinion. 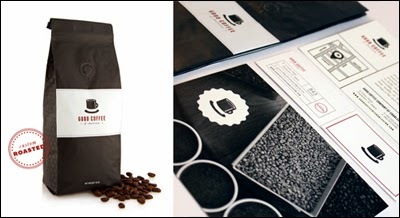 Branding, packaging, and various collateral done for Good Coffee Company of Charleston. Work done at Cobble Hill. 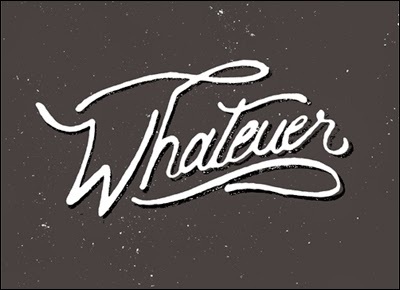 I care greatly about my work, and I want everything that may have my name tied to it to look awesome. So sometimes I get frustrated with the revision process. I’m trying to learn to say yes more, and view changes as a challenge and not as personal critique. I think this is probably something that all designers deal with to a certain degree. I put a lot of thought, research, and time into my designs, so I feel passionately that they are good solutions, but it’s important to have an open mind. Paper and pencil—I keep a Field Notes book on my person at all times, you never know when inspiration will strike. This is going to sound silly but SLEEP. If I’m really struggling with something, I will move on to something else and come back to it the next day—fresh eyes make all the difference. As for collaboration and task management, Basecamp is great for that. I also use Google Calendar for tasks, setting deadlines, and scheduling meetings. 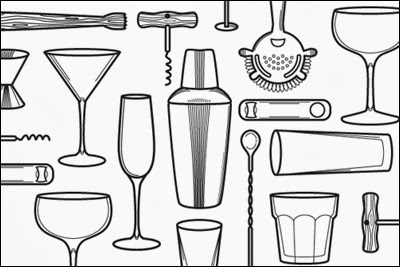 Bar tool illustrations done for Jack Rudy Cocktail Co. Work done at Cobble Hill. I read a lot of design blogs, I work on a lot of self-initiated projects, I draw a lot, I go to industry specific talks and meetups. Sometimes it’s good to just look at what other people are doing too, I check The Best Designs, Site Inspire, Badass Lady Creatives, and Dribbble on a daily basis. Simply: a design without meaning, purpose, or function. 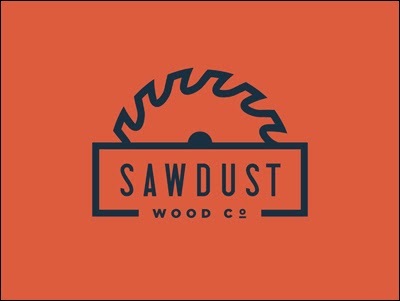 Logo and branding done for Sawdust Wood Co. If you were asked, “Krista, I want to be a multidisciplinary designer?” What’s your response? Don’t wait to learn. If you want to learn how to code, there are tons of resources online to get you started. If you want to be a better illustrator, just start drawing every day. If you want to be a better designer, seek out projects, or start personal projects where you can experiment and explore. In college, I had a professor that really pushed her students to work off the computer to create design elements. This has really stuck with me and is a big part of my design process. I think maybe a lot of young designers think it’s easier to start on the computer, but starting on paper is a really nice way to get lots of ideas down as quickly as possible. This way you can spend more time on polishing the good concepts, instead of wasting energy creating something on the computer that doesn’t work. 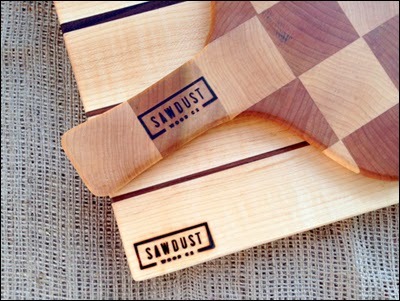 Sawdust Wood Co. logo as a hot brand, in application. How does the city of Charleston, South Carolina, contribute to your work? And what makes it special for startups/business/creativity-at-large? I moved to Charleston, SC, from Charlotte, NC, about two years ago, and I had no idea that there was such a tight-knit, vibrant creative community here. It’s really a great place to be from a creative standpoint. I’m surrounded by tons of truly inspiring individuals! Also, because of the enormous amount of talent here, I feel like there’s a good bit of friendly competition that keeps me on my toes. Visually, Charleston is a really beautiful environment to work in, I try to take a walk every day around town just to get out of my seat, and it has certainly influenced my work. All images courtesy of Krista Engler. Typeface of quotes is Nexa designed by Fontfabric in 2012.